Hartlepool have lost just three of Craig Hignett's 11 games in charge. Hartlepool United boss Craig Hignett has urged his side to maintain their current form and "break records". Pools beat Leyton Orient 2-0 to go six games unbeaten in League Two and have kept a clean sheet in their last four. Hignett's side are 14 points clear of 23rd-placed York City with have two games in hand, and only need eight more to be certain of staying up. "I've said to them, let's see how high we can go and how far we can push ourselves," he told BBC Tees. "While we're on this run and while we've kept four clean sheets, we'll keep going and see if we can break records." 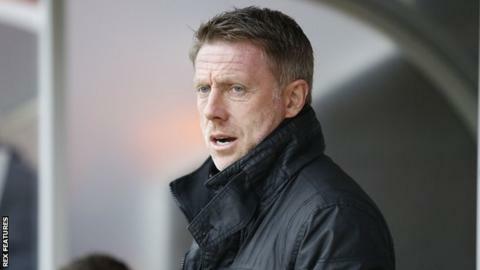 Since his arrival on 10 February, Hignett has steered Pools from 22nd in the League Two table to their current position of 17th. "We have moved up a few places which is nice and gives everyone a lift. When you play well and win games but you're not moving in the table, it's hard," he said. "We've got to carry on doing what we're doing because the way we're playing and the system we're using will win you games." Hignett has played the same starting XI in Hartlepool's last four games and will resist the urge to ring the changes even when safety is guaranteed. "They have earned the right to play, they know what they are doing, they look defensively sound," he added. "Since I've been here we've drummed into them that we're a team, we're altogether no matter what happens with setbacks, it doesn't matter."